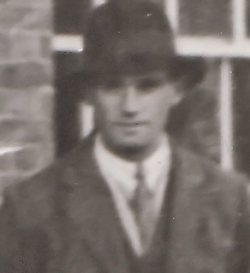 ​​Albert Edward Hogg was born on 16 September 1898 in Frampton, the second son of George William Hogg and Clara Elizabeth (widow of Edwin Leighton) née Hunt. At Albert's baptism, George was recorded as a waterman, but his employment was generally farm work. By 1911 the family had moved from Splatt to live on The Green, probably in one of the Estate's properties on the east side below Frampton Court. Albert and his younger siblings, Mary Ann (Annie) and Walter, were still at school, while his older brother, William Thomas, was already at work. Between 1915 and 1918 they moved again, this time to Vicarage Lane. Although Albert was registered as an absent voter in 1918-19, no records have been traced of his war service, which is commemorated on the plaque in the village hall. In 1939 Albert was working as a labourer for the Royal Air Force Department, presumably at No. 7 Maintenance Unit at Quedgeley, and had moved again to The Street, just to the north of Wild Goose Cottage, living with his widowed father and younger brother, Walter. (At this stage Albert's father, George, was recorded as a gravel digger - at the age of 69!) Albert's final move, with Walter, was to 18 Oatfield Road. Albert Edward Hogg was buried in St Mary's churchyard on 8 December 1970.